The village of Twickenham is situated about ten miles west of London beside the River Thames. In the seventeenth century a number of substantial houses were built on both banks of the Thames in the area, which warranted the need for a ferry linking the Twickenham to Ham on the opposite bank. 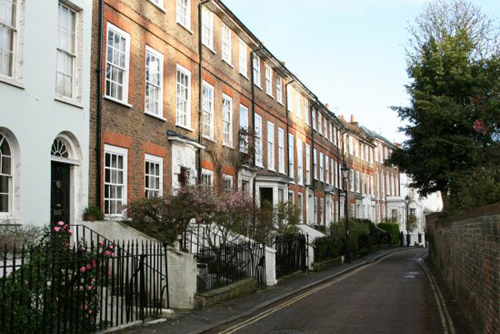 A row of terraced houses (Montpelier Row) was built in 1720 and a smaller terrace a year later (Sion Row) to cater for the rapidly growing population. Much of the original houses survive today. The parish church of St. Mary the Virgin was rebuilt in 1714-15 and there are some remarkable memorials inside the church including one to the poet Alexander Pope and another to General William Tryon governor of the Province of North Carolina (1765–1771). There is no evidence to show who built Sion Row, though the same builder may have been responsible for it and for some houses on the Embankment. Sion Row is dated 1721: the houses are smaller than those in Montpelier Row, and have had fewer distinguished inhabitants, but like the others they preserve much fine work. Together with the surviving later-eighteenth and early-nineteenth century houses along Riverside, the two terraces form a small but authentic part of the old Twickenham. I was employed to devise an appropriate colour scheme for the interior and exterior of the house and to advise on the right types of paint. ‘Twickenham: Introduction’, A History of the County of Middlesex: Volume 3: Shepperton, Staines, Stanwell, Sunbury, Teddington, Heston and Isleworth, Twickenham, Cowley, Cranford, West Drayton, Greenford, Hanwell, Harefield and Harlington (1962), pp. 139-147..